1. KRAUSS. 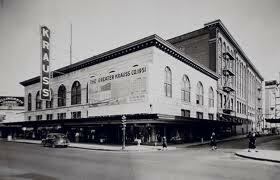 The last of the locally owned department stores, Krauss was not grandly decorated. Located on Canal and Basin Streets, it was THE place to find notions, drapes, fabrics and such. The name is gone but the building still stands as converted condos. What a shame to have lost the name in the process. Coming home to Krauss would have had huge appeal. 2. D. H. HOLMES. Meeting under the clock at Holmes was part of the downtown shopping ritual. Ad-copy writers had a field day "there's no place like Holmes" ... "Holmes is where the heart is" ... The clock, by the way ... is still ticking. It now graces the hotel that stands in its place. 3. MAISON BLANCHE. Holmes and Maison Blanche were the city's twin retailers. Downtown, customers moved easily across the side street that separated the two Canal Street stores. 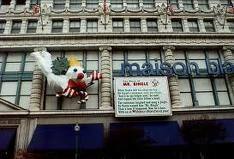 The Maison Blanche name always had more of the local flavor because of its Frenchness and because of its resident Christmas snowman, Mr. Bingle, who shared his initials with the store "MB". I remember the song to this day ... "Jingle jangle jingle ... Here Comes Mr. Bingle". 4. 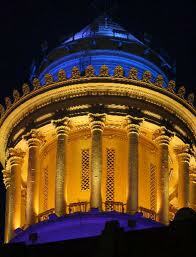 HIBERNIA BANK. This is one name that lasted past Katrina, though it was already endangered. In the bank's last days (before merging with Capitol One), displaced New Orleanians stood in line at far flung branches hoping to withdraw money to finance their evacuation. The familiar green logo was an appreciated symbol of home. The tower atop the downtown building still glows with different colors to reflect the seasons ... and to guide its residents. 5. SCHWEGMANN'S. The supermarket king ... Schwegmann's looked like it was never to be defeated. Outlets across the southern part of the state ruled ... as did family members who were politically active for years. Low prices and "consumer advocates" were part of their reputation. 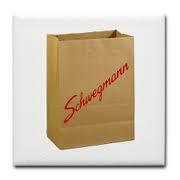 A Schwegmann endorsement printed on a shopping bag could be political gold. It also was the favorite disguise of football fans when they used to dress as "The Aints". 6. KATZ & BESTOFF. Gone forever is the familiarity of the local name that had been whittled down in native language to KB. The drugstore chain's oval purple sign became part of the urban landscape. There was a time that New Orleanians regularly shopped at the two Bs ... MB and KB. But alas it's not Two B anymore. If you want a terrific post-Christmas present to grace a coffee table ... buy this one. You won't be sorry. Sounds like a fascinating book. The demise of the locally owned department store is so sad. @Chrissy ... I so agree.. 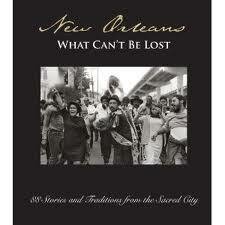 The book is filled with rich stories of a fascinating city. I know how much you love Cleveland and write about it so beautifully. This is a love story to New Orleans.